I love this music, but my copy has a lot of distortion in the mid range. The voice harmonies and piano exhibit this on several songs. I've played it on two different systems to verify it's not the equipment. My copy was a new sealed repress. Picked this up today brand new and sealed. Been a big fan of Vince since my kid started to watch Charlie Brown all of the sudden. I agree that this is the best christmas album you can buy. A major classic cartoon episode and equally this album is still a household item around the globe. Now Vince music and playing style might not be the most advanced and avantgarde of all the jazz giants, but i really love his simple, playful and skilled tones in bossa and easy listening jazz, often with a dash of humor added to it. That is why he was perfect for scoring Peanuts.. In my opinion, this is the greatest Christmas album ever produced. When Peanuts creator Charles Schultz asked Vince Guaraldi to create a festive album to match his CBS Special, A Charlie Brown Christmas, what he was really doing was creating a magical album that was engraved into the hearts and minds of millions of children and adults for the rest of their lives. 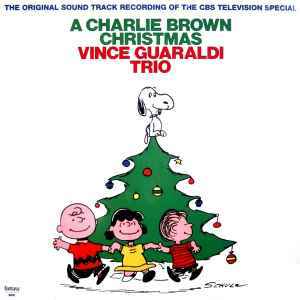 Vince Guaraldi's piano play is superb, and the way he has fun on the keys captures the holiday spirit like no other modern jazz pianist. This album is a must own for anybody who enjoys the Christmas Season.